Osama bin Laden's photo was used in a Massachusetts Senate ad. So what? 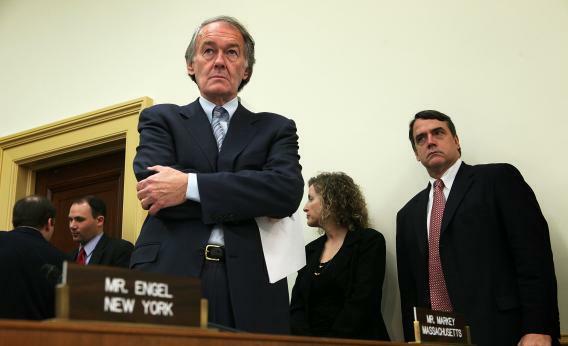 U.S. Rep. Ed Markey (D-MA) waits to speak during a hearing on the Keystone XL pipeline on February 3, 2012 in Washington, DC. In the Massachusetts special election for U.S. Senate, Rep. Ed Markey’s campaign to discredit Republican Gabriel Gomez is an attempt to find a hook in a boring topic. The topic: Campaign finance reform. The strategy: Shame Gomez for his only job in politics, as a spokesman for the sort-of-failed super PAC Special Operations Opsec Education Fund. Its goal: Make it tougher for Barack Obama to brag about the operation that killed Osama bin Laden. Its record: Meh. So the Markey campaign tried to insert the issue into the race with a fairly slapdash web ad. “I was shocked to see that the first advertisement from Congressman Ed Markey’s campaign is a negative attack on Gabriel Gomez that places a picture of him next to the terrorist leader Osama Bin Laden.” said Hudner. “This dishonorable political attack is beneath the dignity of the office for which Congressman Ed Markey is running for and he should immediately take down this outrageous ad. This was a good get. Hudner wasn’t involved in previous campaigns to browbeat Democrats, like Bud Day was with the SwiftVets. But do we need some new rule governing imagery of bin Laden? Any ad like this brings back misty memories of the 2002 ads that started accusing Democrats of kowtowing to bin Laden (and Saddam Hussein) by not voting for the GOP’s version of a Department of Homeland Security. But Markey isn’t saying anything like that. He’s saying Gomez flacked for a PAC that ran ads using images of bin Laden, who’s been dead for two years. Are the images now wholly taboo? *You could call it “auto injury” politics, too. Really any situation where you argue that grievous harm has been done when it pretty clearly hasn’t.